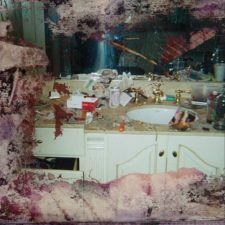 Today, May 25, rapper Pusha-T releases his new album DAYTONA (via G.O.O.D. Music/Def Jam). The album cover has now been revealed, via Push’s new online shop. The DAYTONA art is a photo of Whitney Houston’s bathroom. The photo, reportedly taken in 2006, was released to the public after Houston’s death in 2012.